Voters in the Spanish region of Catalonia have given their backing to nationalist parties but have punished the regional president who called an early election. The governing centre-right CiU led by Catalan President Artur Mas - which pushed for independence - remains the largest party but lost seats. The left-wing separatist ERC party came second. Here people in Catalonia share their views on the election results and their thoughts about the future of the region. I support independence and voted for the separatist ERC. Have a look at Europe's history. Catalonia is one of its oldest nations. It's time for Catalonia to regain its independence. If Denmark, Luxembourg, Belgium, Cyprus, Malta, Slovenia and many others have a say in Europe and control their destiny, why not Catalonia? The turnout was high - about 70% - which means people are interested and place value in the vote. If we add together the parties that support a referendum on independence, we have a majority for independence. The governing CiU party may have lost seats, but this is a party that has not previously supported independence. The results are positive. The move to a referendum would be easier if the pro-independence parties had a very large majority. But it is a good political outcome that there is not a single party calling for a referendum - but instead a number of parties who will have to talk to each other. For me, a vote for independence is not about economics; it is about history, culture and tradition. I think about our constant struggle for independence over decades and decades. I owe it to my parents and grandparents to at least push for a vote on the issue. Perhaps the terrible economic situation makes people more aware of our situation. We feel we are being treated with a certain disrespect by the Spanish government whilst they pick out pockets! Some of my friends seem to be happy that Artur Mas has won the election, and others happy that he has lost seats. I used to vote for CiU but this time I voted for the Socialist Party of Catalonia which does not support independence. I am not sure whether this election outcome is good or bad, and we will see in the next few days how the parties will try to work together. I'm not sure politicians really know where we are going. Talking about independence is the best way to forget the real problems in Catalonia, such as unemployment, homelessness and the privatisation of public health. Maybe I would be interested in independence too - but only after we look for solutions to the real problems. It is true that we Catalans have our own language and culture, but I'm not sure why we have to separate ourselves from the rest of Spain. I think we can be different inside Spain - like in the USA where there are different states within the union. I'm disappointed with the election results as I want to see a big majority for the governing CiU. It is true that first and second biggest parties are pro-independence, and that has never happened before. However, we were hoping for something more dramatic following the huge march for independence in September - a march I joined. I hope the pro-independence parties will join forces so that there will be a vote for independence. 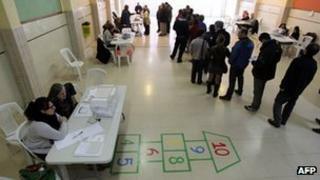 But I think the Spanish government will have a problem with allowing us that vote. Previously I did not support independence and I actually celebrated Spain's victory in the Euro Cup back in 2008 when I was living in the UK. However, me and other Catalans now feel tired of our relationship with Spain. Why do we feel like this now? Firstly we feel have been paying more in tax to Madrid than we get back. Secondly, we have seen no respect at all for our culture and the most important part of it is our language: Catalan. We Catalans are different from people from Madrid or Seville. We have a different culture and a different way of doing things. We really are tired of listening to continuous attacks on our people and culture. And really, really tired of having to pay our taxes to a country that will waste our money on useless projects and always try to ensure that Madrid is the richest city in the country. I do not support independence. I am Catalan but also Spanish and European; I have different elements to my identity and I don't want to choose between them. I used to vote for Artur Mas because he used to be a moderate, but he has changed completely. I don't like the way his CiU party changed their policy to back independence. This time I voted for the Popular Party of Catalonia - a party I used to dislike. President Mas wanted to give a false image of Catalonia being united behind independence - and the Catalan citizens have rejected this view in the polls. Catalonia is far more heterogeneous than Mr Mas wants to portray. It is a personal defeat for him, because he wanted to take advantage of the huge march for independence in September and he failed. We should stop thinking about how to move to independence, instead we should think about how we can create more wealth for our country.